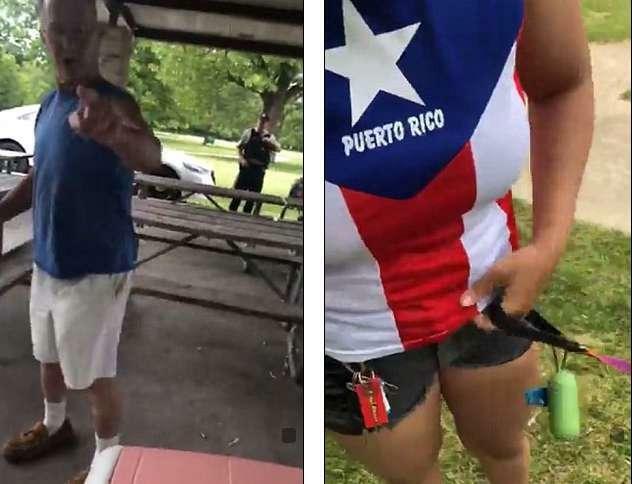 A woman wearing a shirt with a Puerto Rican flag was just waiting for her family at a picnic area in the Forest Preserves of Cook County to celebrate her 24th birthday when a man started harassing her for wearing said shirt. The whole thing was captured on Facebook Live and has since gone viral, and because of it an officer who did not do anything to stop the man from haranguing the woman has been reprimanded. The 36-minute video shows a clearly irate man approaching Mia Irizarry and telling her not to celebrate Puerto Rico if she’s an American citizen. Puerto Rico is, of course, a U.S. territory. An officer from the Forest Preserves arrived but the video shows he didn’t do anything to stop the man who then continued to harangue Irizarry, even invading her personal space and even after she said several times that she feels uncomfortable with the situation and with the intrusive, rude man. Still, the officer did nothing. Irizarry then turned to the officer and said: "Officer, I'm renting – I paid for a permit for this area, I do not feel comfortable with him here, is there anything you can do?" Irizarry’s official relief only came when more officers arrived at the scene and arrested the man. The other officers described the man as drunk. A female officer told the intoxicated man, “ You don't come here harassing people. People have just as much right to be here as you do, and when you're drunk you don't belong here." While the incident occurred on June 14th, the park police officer who did nothing to stop the man or defend Irizarry has now been assigned to desk duty while officials investigate the matter, and assess his response - or the lack of it - to the incident. Caldwell Woods is part of the Forest Preserves of Cook County, and the agency took to social media on Monday to clarify that all visitors to their park should feel safe. They also emphasized that a probe on the incident is ongoing. The agency arrested the drunk man and charged him with assault and disorderly conduct. It is not clear what the explanation of the officer is for not doing anything while the man harassed Irizarry. The Law man should have taken action to defend our citizen, the Puerto Rican. I would warn there are many Cubans (Saterian extremist) going to Puerto Rico that can then come to the US with forged papers so police should check documents closely.